Three Rooms Press, 9780989512527, 168pp. Welcome to New York City. A place where stories lurk around every corner and linger in the hearts of the millions in these five boroughs. 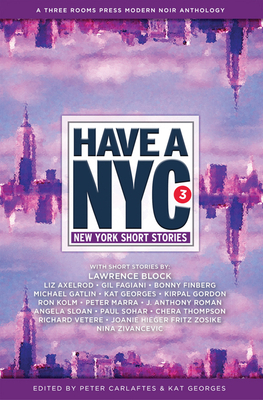 In these pages, tales of the underbelly of -modern-day New York City hook-up with hilarious and -poignant stories of love and loss in this annual collection of thrilling short stories by seasoned and fresh writers who know how to tell them. Edited by Peter Carlaftes and Kat Georges, these stories are sharp and concise, each an unusual take on the swirling panorama of the streets of New York, from Hell's Kitchen to Greenwich Village and Coney Island to Williamsburg, Queens, and beyond. Readers are transported by a modern noir sensibility, populated by a plethora of characters of our times, carving new notches of experience on the city that still fires up the imagination. Authors in this edition include acclaimed crime novelist Lawrence Block (A Walk Among the Tombstones, 8 Million Ways to Die), Liz Axelrod, Gil Fagiani, Bonny Finberg, Michael Gatlin, Kat Georges, Kirpal Gordon, Ron Kolm, Peter Marra, J. Anthony Roman, Angela Sloan, Paul Sohar, Joanie Hieger Fritz Zosike and Nina Zivancevic. Peter Carlaftes is a screenwriter, playwright, actor, poet, and editor. The author of A Year on Facebook, the poetry collections Drunkyard Dog and I Fold with the Hand I Was Dealt, and Triumph for Rent: Three Plays, he lives in New York City. Kat Georges is a writer, poet, editor, director, playwright, and designer. The author of Punk Rock Journal and Our Lady of the Hunger, she lives in New York City.